Technology has improved every facet of our lives. Whether it's the ability to instantly communicate with anyone else in the world thanks to mobile phones or the computing technology that makes these smartphones more adept than early computers, it's clear that we wouldn't be where we are today without advancements in technology. One aspect of technology advancement that many of us take for granted is military technology. Sure, we get some mixture of truth and science fiction on the big screen, but the military sector is one of the places where technology has truly revolutionized their industry. We now have remote battle options through unmanned drones and smart bombs that can literally hit anywhere with remarkable precision. In fact, you could say that military technology is a scary thing or one reason why we are able to sleep so soundly at night. I know personally that I am eternally in awe of the sacrifices that our service men and women make to maintain peace in the world. So, it was with this fascination that I sat down and watched the IMAX film Aircraft Carrier: Guardian of the Seas. The film follows the aircraft carrier USS Ronald Reagan as it leads the massive biennial Rim of the Pacific (RimPac) exercise. The RimPac is a joint international exercise with 55 ships representing 22 countries. The RimPac provides a backdrop to see the full potential of this massive floating fortress. I have seen numerous documentaries about aircraft carriers, but you can tell from the get-go that this IMAX film is special. It goes beyond the basics and truly provides the viewer with an all-access pass inside the massive ship during operations that are as near to wartime efforts as it gets without actually being at war. The film was shot beautifully in 3D and the 4K UHD technology does a wonderful job of translating the footage into glorious detail. The HDR provides stunning colors that you just don't get with even the best HD documentaries out there. I did notice some complaints online about a lack of a 3D Blu-ray offering, but as someone who doesn't particularly care for 3D, I didn't notice it lacking in any way. The scope of the film is almost as massive as the aircraft carriers themselves. The filmmakers do a great job of conveying the emotion of the 5,000 person crew and how they each function within the parameters of their job to create such an amazing armament of war. When you take a minute and realize all of the technological advancements that were necessary to arrive at an aircraft carrier, it truly is awe inspiring. 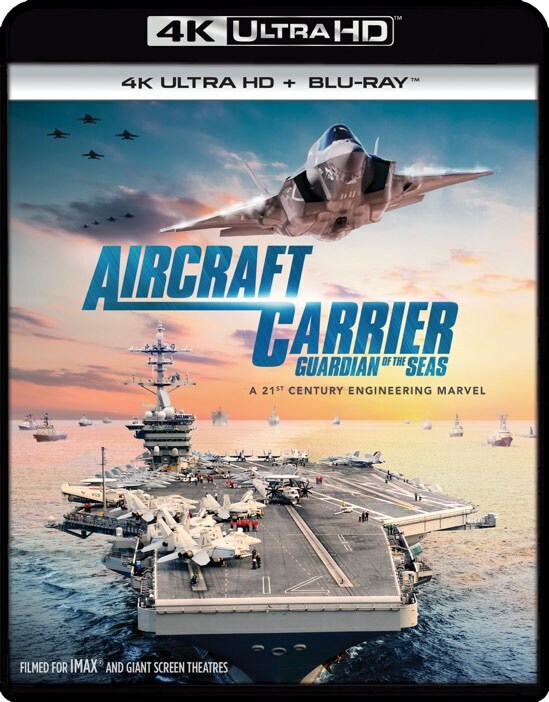 The IMAX film Aircraft Carrier: Guardian of the Seas is a top-notch military film that helps to encompass all that the armed services has to offer at the highest levels. The 4K UHD is chock full of bonus features that really adds value to the purchase of the film. These enhancements truly make the 4K UHD a value addition to any documentary fanatic's library.